I love the culture of my state. In West Virginia, we are not southerners, we are not Yankees, we are just good ol' fashioned country people. "What can I bring you for dinner?" With one simple FB message, a weeks worth of meals were heading their way! Let me just tell you that does not happen everywhere, and it is one of the MANY reason I LOVE being a Mountaineer! So what did I bring you ask? 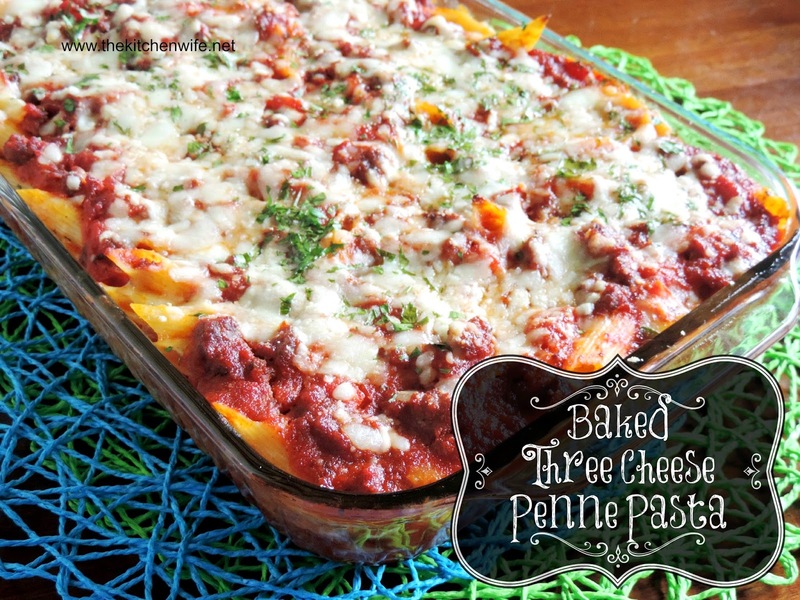 I brought the most AMAZING Three Cheese Penne Baked Pasta you have ever tasted of course! Let me how you how I made it! You will notice right off that there are no onions, garlic, or green pepper in this sauce. That is because I am making this for a family with children. a jarred sauce, and powdered seasonings. This way you get all of the great flavor, without the ingredients that may be a little less desirable to children. One thing that will not change, is that you will begin by bringing a salted pot of water to a boil. When the water comes to a rolling boil, add the pasta and cook until TWO MINUTES UNDER the recommended time on the box. Place your skillet over medium/high heat, brown the ground beef. Be sure to season with salt and pepper. When your meat is browned, add the whole tomatoes. Next, add the jarred sauce. And garlic powder, as well as salt and pepper to taste. Take your rubber spatula and gentle break up the whole tomatoes. Then allow to simmer for 10-15 minutes. Remove about a cup of the sauce and set aside to cool. 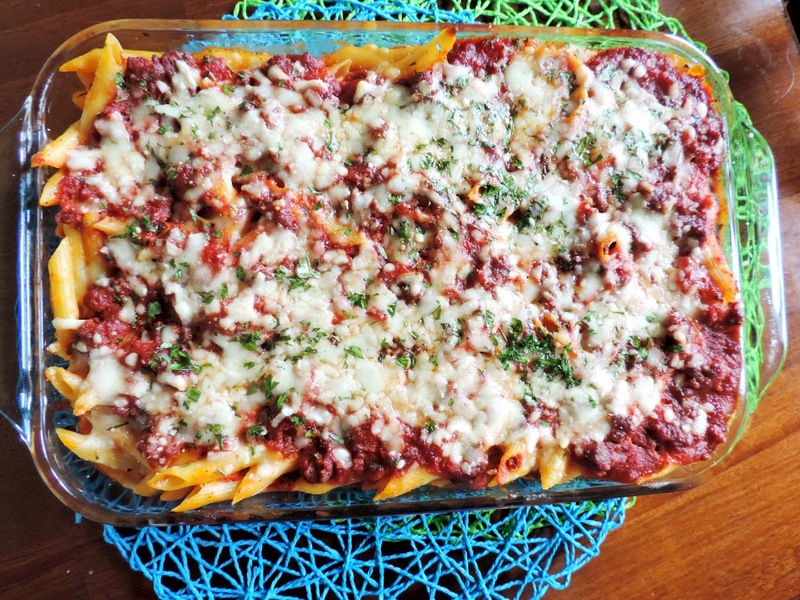 When your pasta is finished cooking, add it to the cheese mixture. Stir until all of the pasta is coated. Now it is time to bake! Add a little of the sauce to the bottom of the baking dish. This will help keep it from sticking. Now add a layer of pasta. Sprinkle with the remaining chopped parsley. and place in a 375 degree oven for 20-30 minutes until golden brown. *sigh* Would you look at that!?! Who WOULDN'T want to eat that!?! I guarantee that if you bring this to a friend's table, or even your own table for that matter, it will be a total show stopper! Everything you want your pasta to be! I sent this along side a simple salad topped with bacon and cheddar cheese, and homemade ranch dressing. OH YEAH! Give this great pasta dish a try tonight, you won't regret it! Add pasta and cook until 2 minutes under what the box recommends. Place the deep skillet over a medium/high heat. Add the ground beef and season with salt and pepper. While the ground beef is browning, combine the mascarpone, 1/2 the mozzarella, 1/2 parmesan, egg, 1/2 of the chopped parsley, salt and pepper. When the meat has browned, add the whole tomatoes. Add the brown sugar, onion powder, garlic powder, with salt and pepper to taste. With a rubber spatula, break up the whole tomatoes, and allow to simmer 10-15 minutes. Place 1 cup of the sauce in a separate bowl and allow to cool. Once cooled, Add the cup of sauce to the cheese mixture and stir well. When the pasta is finished cooking, add to the cheese mixture. To a baking dish, lightly cover the bottom with sauce. Add half of the pasta. Half of the shredded cheese. Top with chopped parsley and place in the 375 degree oven.